Wearing a Vivienne Westwood, Priyanka attended the premiere of Isn’t It Romantic on Monday evening in Los Angeles. I know the snug fit at the bust might be a deal breaker for some of you, but because she looked so good overall, it wasn’t one for me. Loved her here. So, tell me, was it a deal breaker? Wearing a Teresa Helbig dress, Priyanka attended a pre-Grammy party on Saturday in Los Angeles. Bright red pumps and a Dior mini bag finished out her look. I didn’t like her earlier Helbig outing but this one, I had no complaints. She looked great! 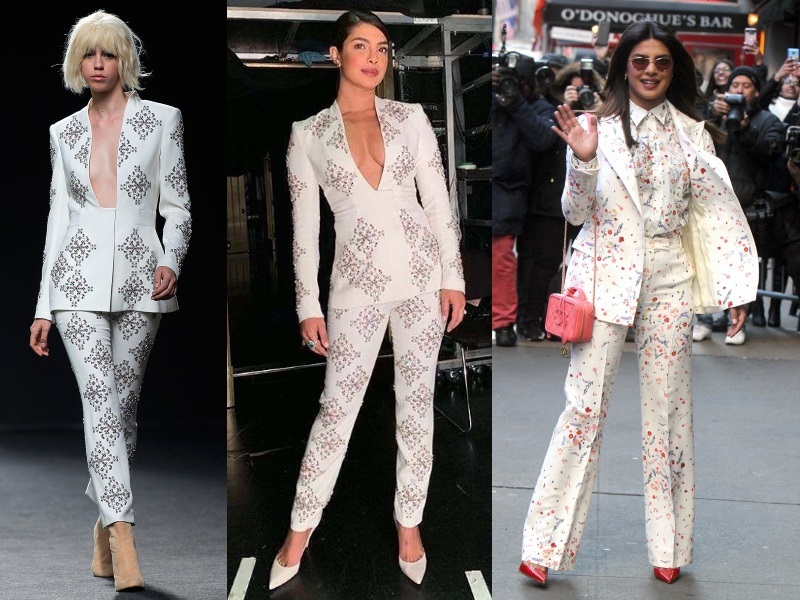 Priyanka opted for two white pant suits back to back while promoting Isn’t It Romantic but between the two, much preferred her in the Ermanno Scervino one. The Teresa Helbig would’ve been a lot more impactful had she worn the blazer shown on the runway model (far left). Agree? Priyanka and Nick attended a gala on Thursday evening where she was seen wearing an Elie Saab gown and Nick in a classic black suit. While it was they looked nice, the gown deserved a better hairdo, don’t you think?